WINE WITH A VIEW: Estate grown chardonnay, vineyard designated pinot noir, and juicy red blends come together at Biddle Ranch, where the verdant vineyard views seem to roll on forever. These days, the weather forecast is balmy and mild in Edna Valley, where recent rains have encouraged sprawling vines to transform from grizzled gold to verdant green. The holidays are fresher in this miraculous microclimate just a few miles from the salty Pacific. Fertile fields, pink coastal sunsets, and anticipated winter wine releases are the greatest gifts of the season. At Biddle Ranch, that spirit of natural wonder is alive and well. You can see it in the nearby farm fields flush with Brussels sprouts and pumpkins. You can feel it as you walk up the concrete path to Biddle Ranch Vineyard’s newly constructed tasting room, flanked by native grasses and a fountain made from an ancient dairy trough that once graced the 23-acre property. When I enter the sleek, modern tasting room on a crisp yet sunny morning just before Thanksgiving, my eyes are instantly drawn to the panel of floor-to-ceiling windows looking out over 17 acres of healthy chardonnay vines. This focus is entirely by design. As my tour guide and Biddle Ranch General Manager Leigh Woolpert tells me, the winery’s slogan is as uncomplicated as the vines: Simple. Authentic. Inspired. 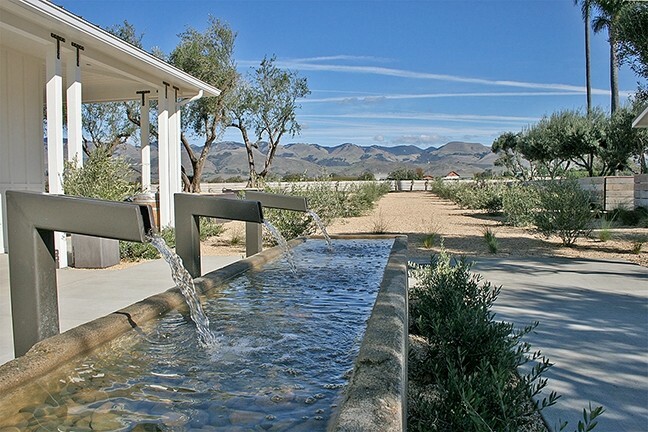 RECLAIMED ELEGANCE: An old dairy trough is transformed into a modern fountain masterpiece at Edna Valley’s newest tasting room, Biddle Ranch Vineyard. The new tasting room and production facility measures in at about 3,000 square feet and features high ceilings that go with an overall fresh, minimalist feel. 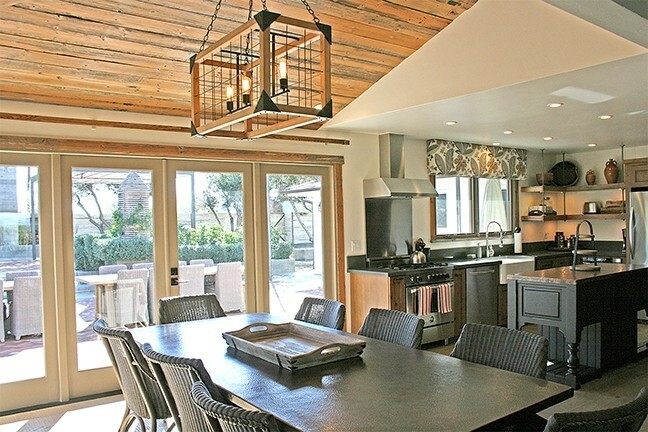 That, coupled with a rustic charm, makes for a truly cowboy-meets-wine-country sensibility. From the outset, tasting room guests will no doubt notice the bounty of outdoor seating surrounded by native plants and ancient palm trees. Community tables and lounge-worthy chairs create a relaxed vibe that encourages folks to rub elbows and raise a glass to the land. 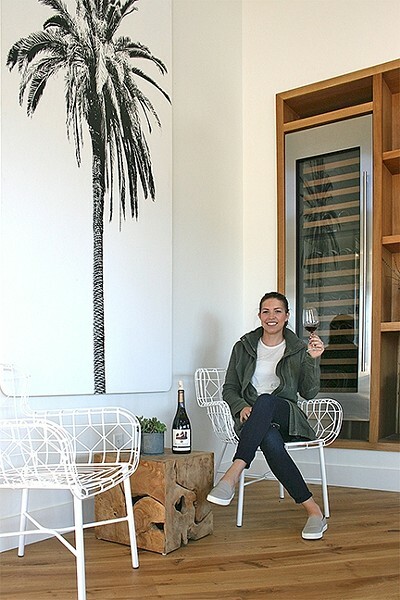 MEET ME UNDER THE PALM: Biddle Ranch Vineyard General Manager Leigh Woolpert raises a glass of earthy pinot noir to the year ahead among the graphic palm tree décor, which adds a splash of quirk to the Edna Valley tasting room. Woolpert notes that’s exactly what the owners were going for. Established in 2013, Biddle Ranch Vineyard is the brainchild of four local families: the Fortinis, the Rawlings, the Roncas, and the Woolperts. 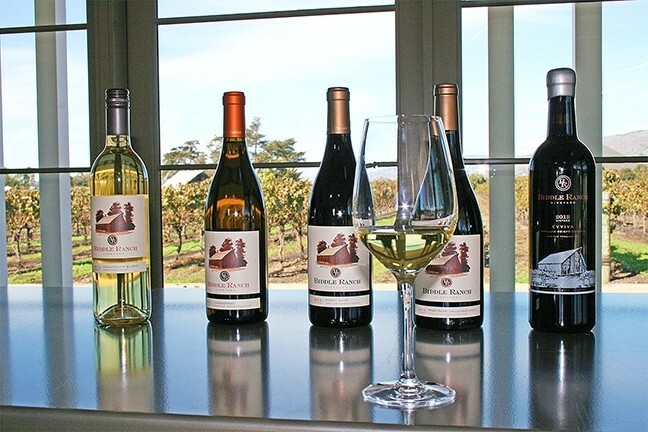 As for the wine, Biddle Ranch is about two things: the careful selection and preservation of grapes and unfussy, old-world-style wine making. That doesn’t mean you won’t be pleasantly surprised when you taste through the latest offerings, though, which include a sauvignon blanc, estate chardonnay, two vineyard specific pinots, and a red blend of sangiovese, cabernet sauvignon, syrah, aglianico, and merlot. The common thread is enchanting. Acidity, freshness, and restraint unite them all. A vibrant energy lingers on the tongue. Thanks go in large part to Biddle Ranch winemaker Ryan Deovlet—known for his work with legendary Central Coast winemaker Stephen Ross and his own label, Deovlet Wines. BREATH OF FRESH AIR: Rustic charm meets sleek minimalism at Biddle Ranch Vineyard’s vacation house, where guests can breathe easy, taste wine, make wood-fired pizza, and enjoy pretty vineyard views. The winemaker understands the dance between balance, elegance, and restraint. Just try Biddle Ranch’s 2014 estate chardonnay, which the winemaker put through a melange of treatments, including varying oak barrels, stainless steel, and concrete tanks. I say, this holiday season, give yourself a break at Biddle Ranch. Feel free to buy a bottle of wine and kick back for a spell. Cozy up with a glass of the winery’s newly released 2014 sparkling estate chardonnay. What better way to celebrate classic Edna in the New Year? Woolpert says she hopes locals will make themselves at home (in fact, servers will come to your table to keep the good stuff flowing). When things get hectic and the holidays feel frazzled, it’s good to know that Biddle Ranch is all about moving slow, savoring good wine, and experiencing the quiet calm of Edna’s lush landscape. You just can’t rush simple pleasures. EDNA ADVENTURES AWAIT: Biddle Ranch Vineyard tasting room is located at 2050 Biddle Ranch Road and open Thursday through Monday from 11 a.m. to 5 p.m. and by appointment. Call 543-2399 for more information on the winery and wine club, or go to biddleranch.com. Hayley Thomas Cain is making more time to slow down and savor. She can be reached at hthomas@newtimesslo.com.